Agbiz is the only organisation that serves the over-arching and common strategic business interests of agribusinesses in South Africa. The core focus of Agbiz is to create an open, competitive and macro-economically sound environment within which its members can operate successfully and prosper. Agbiz facilitates considerable networking opportunities so that South African agribusinesses can play an active and creative role within the local and international organized business environment. Agbiz is closely involved in the legislative and policy environment on many fronts. Agbiz is an affiliate of Business Unity South Africa (BUSA) and associated with various international organisations such as the Business and Industry Advisory Committee to the OECD (BIAC), and the International Food and Agribusiness Management Association (IFAMA). Dr Purchase joined the Board of IFAMA in 2012, a major honour for Agbiz. Agbiz has an effective administrative structure and dynamic personnel complement. Before you apply for membership, we invite you to read the Constitution of Agbiz. For a copy, please click here. By submitting an application for membership, you are deemed to have read and accepted the Constitution. Once submitted, your application for membership will be reviewed by Council. Council meets approximately three times a year. You will be notified of the outcome of your application after the Council meeting. What does membership cost and what are the terms of payment? Two types of membership are available, viz. 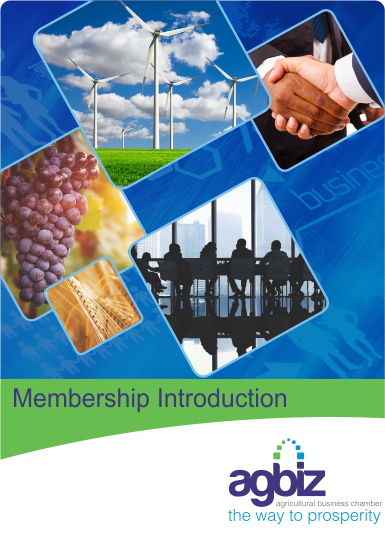 basic and corporate membership. Calculated at 0,006% of the average turnover of the organisation over the last three reporting years, with a minimum fee of R22 300-00 (inclusive of 15% VAT) per annum. R261 500-00 (inclusive of 15% VAT) per annum. If a member’s membership fee were to fall between the minimum fee of R20 700 and the maximum fee of R242 700, then the 0,006% of the average turnover figure would be the membership fee the organisation would be liable for. This calculated figure will stand for three years, each financial year only increasing with council meeting accepted inflation percentage. At the end of the third year, all members will be requested to submit their new three year turnover figures so that a re-calculation could be done in order to determine if they qualify to move up to corporate membership level, which will be above the corporate membership fee amount as agreed upon for that financial year. When joining as a member during the financial year, membership fees payable are pro rata for the remaining part of the year.